President Donald Trump has promised to overhaul the nation’s trade policy and pull out of free trade agreements as part of his America First policy. In particular, the president has been highly critical of the North American Free Trade Agreement (NAFTA) and the Trans-Pacific Partnership (TTP), saying that they’ve hurt American workers by sending jobs abroad. There are also many other trade deals around the world that could impact international investors. In this article, we will look at three trade deals that investors should watch, including those involving the United States and Britain. The North American Free Trade Agreement — or NAFTA — is a ​free trade agreement between Canada, Mexico, and the United States established in 1994. Most economists agree that NAFTA has had a small net positive effect on the United States, a large net positive effect on Mexico, and an insignificant impact on Canada. However, several politicians have accused the agreement of sending jobs abroad at the expense of the middle class. President Trump has called NAFTA “the single worst trade deal ever approved in [the United States]” and promised to either renegotiate to break the agreement. When renegotiating, he has suggested requiring Mexico to end its value-added tax on U.S. companies and ending the maquiladora program that enables U.S. companies to move operations over the border. He may also implement snapback tariffs in domestic industries damaged by imports. The process of ending NAFTA would be legally complicated. Some experts believe that the president has the right to withdraw from trade agreements under Section 125 of the Trade Act of 1974, while others cite NAFTA’s Implementation Act that would require Congressional approval. Since many Republicans support free trade, it’s uncertain whether Trump would get enough support in Congress to support a full repeal. Of course, Mexico would suffer the most from any withdrawal from NAFTA. International investors may want to consider hedging their portfolios against these risks as the Trump Administration continues to push for changes to NAFTA. The TransPacific Partnership (TTP) is a trade agreement between Australia, Brunei, Canada, Chile, Japan, Malaysia, Mexico, New Zealand, Peru, Singapore, the United States, and Vietnam. While the finalized proposal was signed in February 2016 under the Obama Administration, President Trump promised to withdraw from the agreement on the campaign trail and signed a presidential memorandum to do so in January 2017. The other 11 countries involved with the TPP agreed to revive the deal without the United States in May 2017. According to the World Bank, the TPP could raise gross domestic product in member countries by an average of 1.1 percent and increase trade by 11 percent by 2030, as well as improve real wages by a significant amount. Vietnam, for example, could see real wages for unskilled workers rise by more than 14 percent by 2030 as production shifts to the country. The departure of the United States from the agreement is likely to be a marginal negative for the domestic economy, but the move to revive the agreement will be a net positive for the other countries involved. International investors should consider these improvements when looking at investments in these countries given the potential to increase economic growth, as well as stimulate consumers spending through wage inflation. Britain’s decision to leave the European Union sent shockwaves throughout the financial markets and took many economists and analysts by surprise. Despite the dire warnings, the country’s domestic economy hasn’t suffered as much as anticipated, but the worst could be to come as the country gears up to leave the common economic area. The country has already started drafting plans to enact the departure. As part of the process, Britain will be forced to renegotiate trade agreements with the European Union and other countries around the world. These agreements could have a big impact on the country’s economy as they’re announced. Negotiations with the EU are expected to begin as soon as June 19, 2017 — or roughly a year after the June 23, 2016 ‘Brexit’ vote — but the finalized plans may take months or even more than a year to develop. International investors should keep a close eye on these negotiations, particularly given the new leadership that’s more nationalist than globalist. 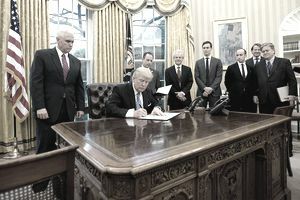 Free trade agreements have been put at risk by new nationalist leadership in the United States and Britain. International investors may want to keep an eye on these agreements as potential risks and opportunities around the world. Should You Own Foreign Stock Shares?